This is an extract from Hey Ho Let’s Go, Everett True's biography of The Ramones, about Tommy who died on Friday. I would have posted it on Saturday but did not have access to the book as a digital document. The photo was taken by Bob Gruen. Yeah, well it’s the old joke about how do you tell when the drummer’s knocking on your door? He speeds up at the third knock. Yeah, he’s fascinating. I spoke to him the other day on the phone – he’s so unassuming. 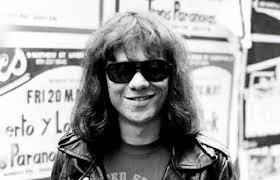 TOMMY RAMONE WAS born Tommy Erdelyi on January 29, 1949 in Budapest, Hungary. At school, Tommy was into The Beatles, playing his guitar and listening to music – a good guy, but quiet. After he graduated in 1967, Tommy became a recording engineer at Manhattan’s Record Plant, where he worked with Hendrix on his Band Of Gypsies sessions, Leslie West (pre-Mountain), and on John McLaughlin’s Devotion album. Tommy then took a job at a film company near the Museum of Modern Art and would take long lunch breaks so he could see avant-garde films by directors like French surrealist Luis Benuel that showed there. Tommy knows the exact moment when he realised how good the Ramones were. It was in ‘74, in the Art Garden. Dee Dee and Joey were going over one of Joey’s songs, ‘Judy Is A Punk’. Choosing the name was easy. They lifted it from Dee Dee’s Sixties alias. Other stories have appeared as to its origin, however. It was chosen in homage to the street tough image of the Fifties greaser rockers. Joey told a journalist that they thought it had a ring to it – like “Eli Wallach”. I went to Stephen A Halsey Jr High and Forest Hills High school with him. He got me to pick up the bass guitar and enter into the crazy world of rock music. We played in several bands together (Triad & Butch) here in NYC over the late 60's and early 70's. We built and managed Performance Studios in NYC, a recording/rehearsal studio the Ramones started in. I worked with him when he was in the Ramones and well after he left. He had an advanced musical foresight, well ahead of the times in forming and being part of the Ramones. He was a great musician on the guitar, then the drums, later on the mandolin, banjo, fiddle and many more instruments. His musical expanse bridged from Punk to Indie Bluegrass. "On The Road with the Ramones"